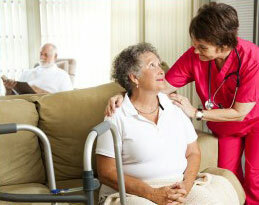 Meadowbrook Healthcare has been providing Skilled (24-hour) Nursing Care to our community since 1974. Over the years, families have entrusted us with the care of their loved ones. We are a 5-Star Award recipient from the Centers for Medicare & Medicaid Services (CMS), an award that is given to the top 10% of nursing homes within a state. Our philosophy encompasses caring for the whole person by providing an environment that contributes to the resident’s well-being and the family’s peace of mind. Our highly trained Registered Nurses and Certified Nursing Assistants provide 24-hour care and monitoring for your loved one. Care plan meetings are conducted regularly to evaluate the progress of all our residents. Along with our standard amenities, residents benefit from an enhanced staff-to-patient ratio, comprehensive therapy programs, Dietician-directed nutritional plans and a variety of structure activities ranging from crafts to entertainment.